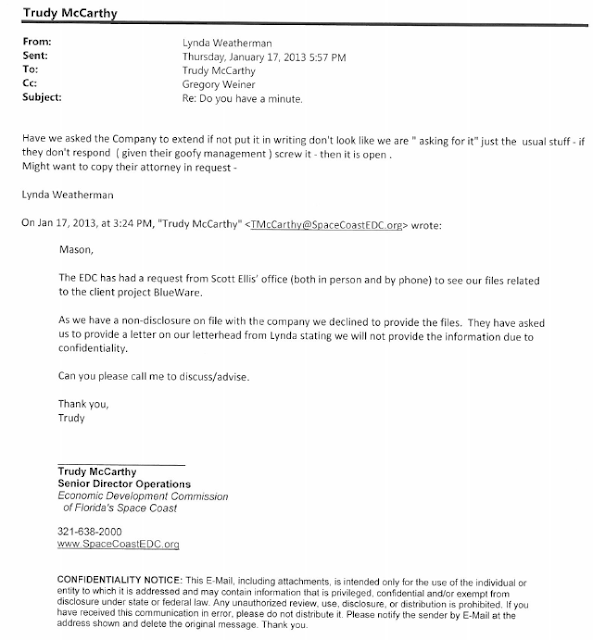 BREVARD COUNTY, Florida - Among the handful of documents recently released by the Economic Development Commission of Florida's Space Coast to Brevard County Clerk of Court, Scott Ellis, after three years of costly litigation was an email by EDC President, Lynda Weatherman. In that email, Weatherman referred to BlueWare's management as "goofy" and instructed staff to obtain a confidentiality extension from BlueWare days after Ellis had already made a public records request. Weatherman specifically instructed staff to make the request to BlueWare without " ... looking like we are "asking for it" just the usual stuff... "
At first glance, the EDC documents released on August 16, 2016 when ordered to do so by Brevard County Circuit Court Judge John Dean Moxley, Jr. seemed rather innocuous. But after a month-long review by Brevard Times of years of documents, timelines, court testimony and filings, the reason why the EDC fought so bitterly to not release those few documents appears to have come to light - at least with regards to Weatherman's email. 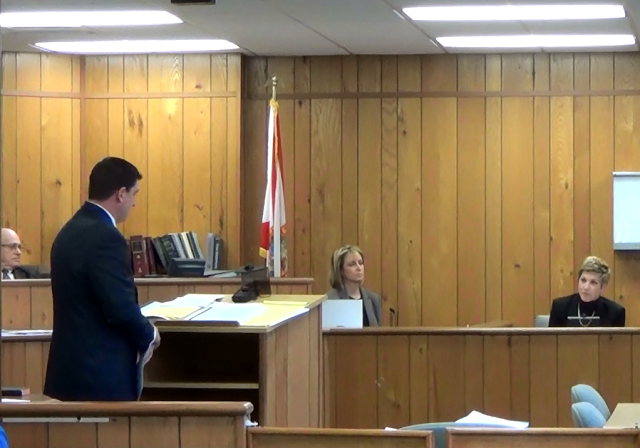 That's because the email directly contradicts courtroom testimony given by Weatherman under oath during the trial in the Florida public records lawsuit brought by Ellis. During the first trial, Ellis' attorney, Curt Jacobus, Esq., asked Weatherman, "Did you notify BlueWare of these confidentiality statutes?" "No. I was not working that project, but I don't believe so," Weatherman testified. 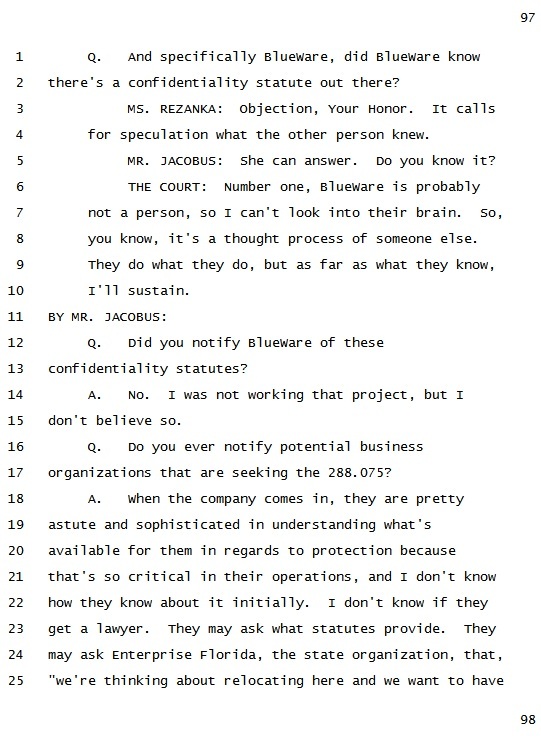 The email reveals that Weatherman not only did in fact instruct her staff to notify BlueWare to extend the confidentiality agreement, but that she had to have had some hand in the BlueWare project to be able to form the opinion that BlueWare's management was "goofy." Jacobus then asks Weatherman, "Do you ever notify potential business organizations that are seeking the 288.075 [confidentiality statute]?" "When the company comes in, they are pretty astute and sophisticated in understanding what's available for them in regards to protection because that is so critical in their operations, and I don't know how they know about it initially," Weatherman replied. Although Weatherman was speaking in general terms about businesses seeking economic incentives, her email also shows that she considered BlueWare's management "goofy" rather than "astute and sophisticated."